I found myself leaving the shifter in normal mode, which is the most economical way to go, and then slipping it into Sport at stoplights. Fun, and zippy! 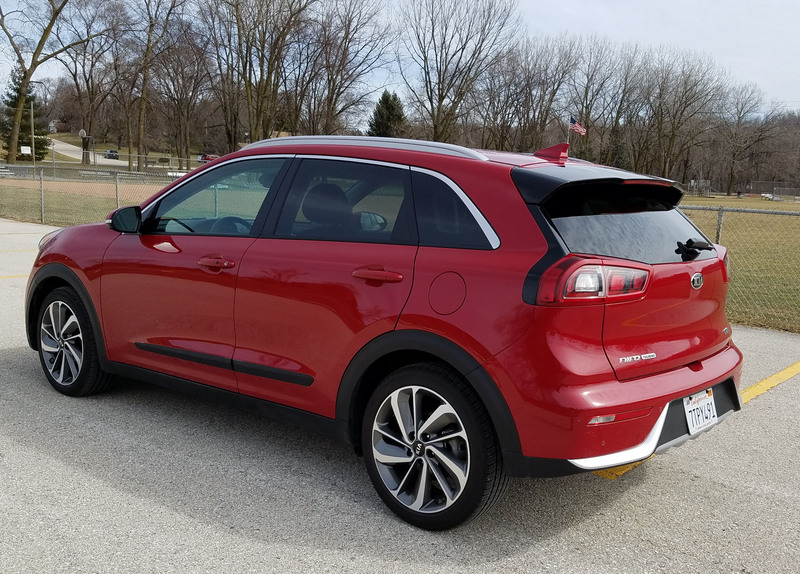 Plus the Niro is so well put together and along with that electric motor is just so darned quiet. Not many compact cars can claim this level of smoothness and quietness inside. Handling? Well, again once in Sport mode the steering wheel’s feel firms up and the Niro behaves more like a sport sedan than economy hybrid. Take a lesson Prius. In Normal mode the steering is light and easy, but with Sport there’s a more precise feel with more feedback. Again, fun! Ride is well controlled and pleasant too. This is a small car, but not tiny. It’s longer than last week’s Jeep Renegade and rides on a 106.3-inch wheelbase. That, along with an independent rear suspension smooths out the ride considerably and keeps the car from becoming jittery over rough city streets. 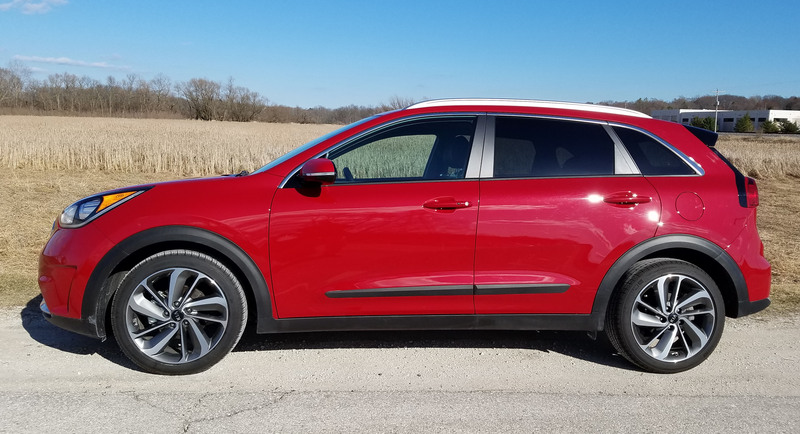 The Niro Touring comes with 18-inch tires too. Other trims come with 16-inchers. 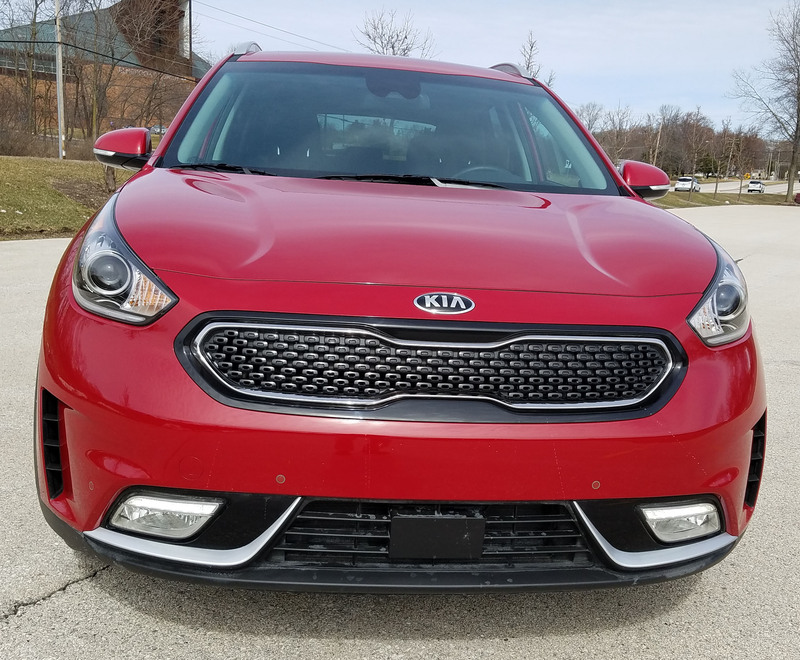 Braking is fine and the Touring model includes blind-spot warning and adaptive cruise control, lane departure warning, plus a backup camera is standard. Inside, the bright red test car featured a black textured dash and being the upscale trim it came with black leather seats that were both heated and cooled. The seats have gray stitching to add to the interior’s style, plus graphite gray dash trim and gloss black edging by the center screen, shifter and on the doors. Everything looks good and the dash is another Kia gem, logically laid out with all buttons and gauges simple to see and use. The main gauges are snazzy looking and the center screen is split to see radio and navigation at one time, or you can devote the full screen to either. Two climate control knobs are easy to use and all the adjustment buttons on the center stack are big enough to press with a gloved hand and the labeling is simple. Dual zone climate controls are standard. Niro has a manual tilt/telescope steering wheel with the usual cruise control, trip computer, radio and phone controls on its hub. The steering wheel also is heated, it and the seat climate controls being conveniently found on the console, not several screens in on the main dash screen as more pricey cars and crossovers prefer. 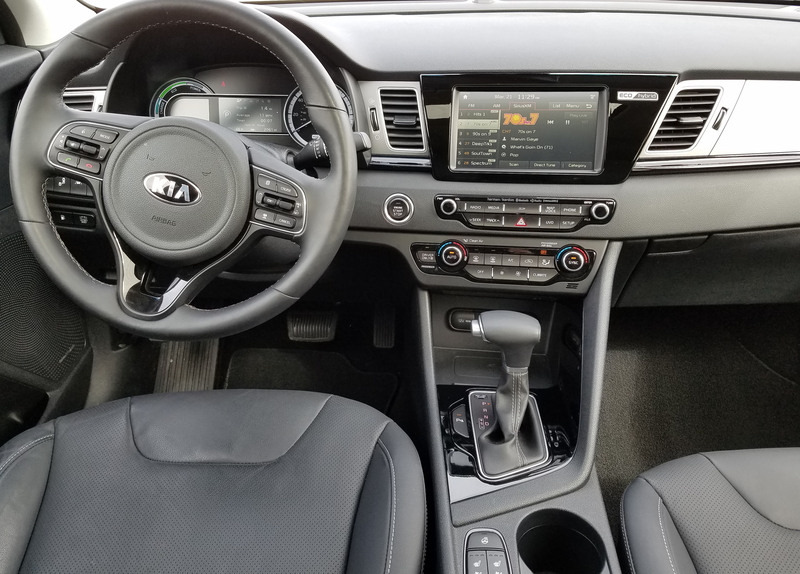 Kia includes its UVO infotainment system too with an easy to tune and set radio, plus Apple CarPlay and Android Auto compatibility. It also gives you 8GB of music storage. Overhead in the gray roof liner is a power sunroof with pull-shut cover to block sun as needed. Sun visors also slide. In the cubby below the center stack you’ll find the usual assortment of electrical hookups, including two 12-volt plugs, a USB port and auxiliary hookup. There’s also a coin holder in the console and a fine armrest with storage box beneath where you’ll find a charging port for your phone, etc. Seats are powered and include a power lumbar. They are well shaped and comfortable, but a flatter in design than some. Still they offer good hip and back support. 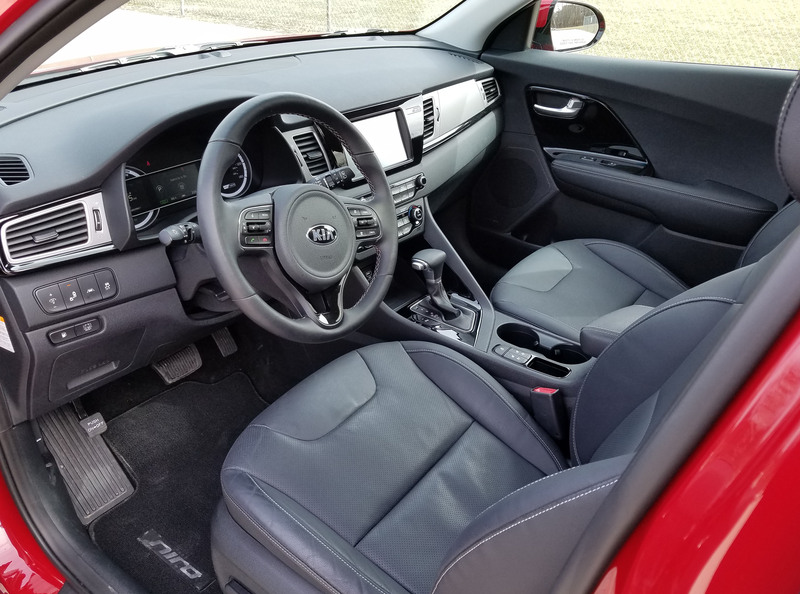 This is a four-door and there is ample room in the back seat for a couple adults, plus Kia includes a monster 19.4 cubic feet of cargo room behind the rear seat. Fold it down – it splits and folds flat – there’s 54.5 cubic feet of room. That’s even more than last week’s roomy Renegade. Plus there is even some storage under the cargo floor for small items or tools. Then there’s the gas mileage. I mean why buy a hybrid unless you want to stretch your fuel mileage? I got a fine 35.6 miles per gallon in about an even mix of city and highway. As with all hybrids, city mileage is projected to be better than highway. EPA says to expect 46 mpg city and 40 highway. It’s possible my love of the Sport setting cut into my mpg a bit. 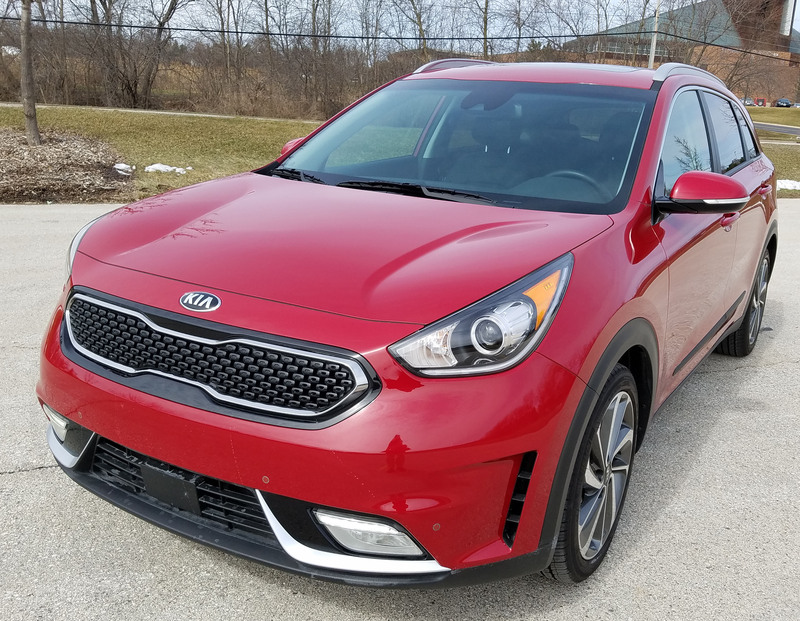 Also note that the Touring model, because of weight added by its plethora of desirable equipment, gets lower mpg than other Niro models with less content. Those are expected to average about 49 mpg, says the EPA. Pricing is another pleasant surprise. 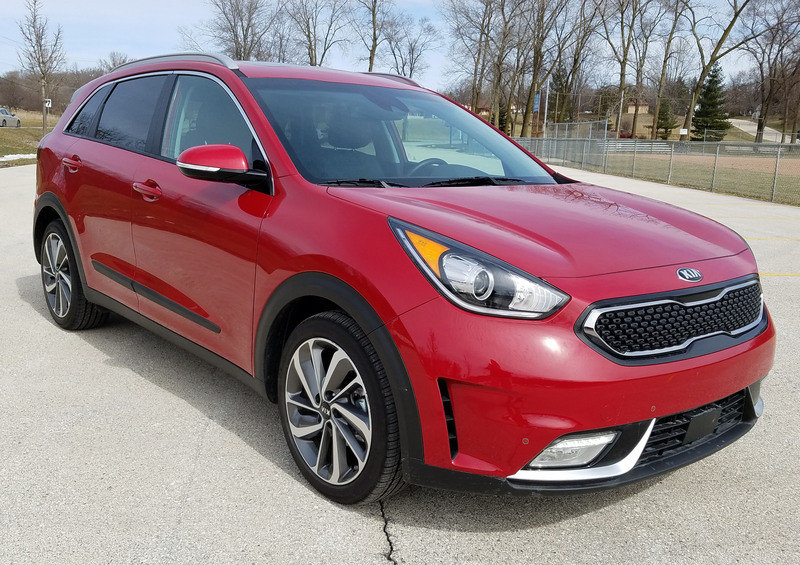 The Kia Niro FE starts at just $22,890, which bests many of its competitors, including the Prius V Two, Honda HR-V and Ford C-Max to name a few. Admittedly the Honda comes with AWD though. And there are five trim levels to allow you to slot into the price range or equipment level you want. From the FE pricing moves up to $23,200 for the LX, $25,700 for the EX, $28,000 for the Touring Launch Edition and $29,650 for the tested Touring model, which added only floor mats for $130 and a $895 delivery fee to hit $30,675. In most trims this is an automotive bargain for hybrid efficiency. Note too that Kia’s sister brand, Hyundai is now offering a similar hybrid model, the Ioniq, but it looks much more like a Prius than the stylish Kia. So if you want hybrid efficiency that’s fun to drive and looks less nerdy than a Prius, this is a stellar choice, in fact, the only real choice. 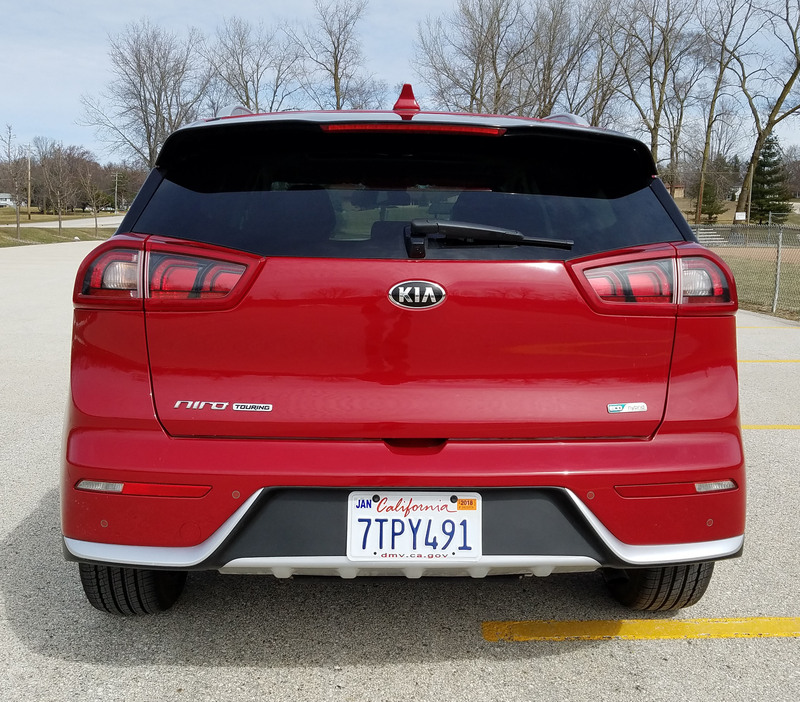 Niro is a winner and deserves a test drive if you’re in the hybrid market, or if you just want a good looking car that delivers a fun, comfortable drive with super mpg. Hits: Good looks, handling and fuel economy. Has plenty of power in Sport mode, quiet and smooth operation. Sunroof, heated steering wheel and front seats, plus cooled front seats. Has blind-spot warning, rearview camera, roomy second row seat, good cargo space under hatch, and easy dash to see and use. Price makes it a bargain hybrid.